Cash Bar at a nearby pub (TBD) following the tour. Invest in yourself! Join SLA NY at Baruch College on Thursday, September 18th for a packed day of learning and networking. The program will kick off with a keynote address from SLA’s President-Elect Jill Strand. An Expo showcasing exhibits from top suppliers to the information community will be on show throughout the day. Parallel tracks will feature local experts on using social media for business and research purposes, and broader professional development topics too. All sessions are designed to be as interactive as possible in order to maximize your learning opportunities, and we hope all attendees will come along with challenging questions and issues for our speakers to address. The day will conclude with a gala networking reception, where you’ll be able to meet and mingle with panelists and business partners and connect with your peers. One of the afternoon sessions will be a speed mentoring event – take your question to as many of our expert mentors as time allows. Availability for this is strictly limited, so book your conference place early to avoid disappointment and be sure to follow the special link from the registration page. We are extremely grateful to our business partners for their continued support of SLA NY. Companies exhibiting on September 18th will include Bloomberg, BMI, cSubs, Ozmosys, PLI, PrivCo and TRAK Records/Special Counsel. Baruch College Vertical Campus, Lexington Ave at East 24th St. The New York Library Club,Inc. What: The New York Library Club, Inc. invites you to its Spring Networking Event & Annual Business Meeting featuring remarks by special guest, Garry Pierre-Pierre,Executive Director of the Center for Community and Ethnic Media at the CUNY Graduate School of Journalism and a tour of the school’s Research Center led by Tinamarie Vella, Library Manager. When: Tuesday, June 10, 2014 at 5:30PM. At the business meeting following the program and tour, we will have elections of Board Members and announcements of future plans.Following the meeting, those who wish can continue networking at a nearby lounge (cash bar). 212-288-6900 ext.201to reserve your place by June 5. June 6. A picture ID is required to enter the building. Ian Frazier: Defending New York’s Public Libraries : The New Yorker. he New York Public Library’s announcement that it is abandoning its Central Library Plan has been praised as a good and sensible thing, and indeed it is. The C.L.P. would have sold off the Mid-Manhattan Library and the Science, Industry, and Business Library (called SIBL; five of its floors not open to the public have been sold already). The collections of those libraries would have been moved to the main research library, on Fifth Avenue, and elsewhere. That hundred-and-three-year-old edifice (now known as the Stephen A. Schwarzman Building), with the stone lions out front, would have been reconfigured: seven floors of its stacks taken out, a lending library added to what had been a research library only, more than a million books moved off-site, and a four-level atrium and other new elements put in, following a design by the architect Norman Foster. Two days after the soldier Adolf Hitler wrote this postcard to his comrade Karl Lanzhammer telling him about avisit to the dentist, he wrote another one on 21 December 1916 about the painful visit, where he claims 19 of his teeth were extracted. 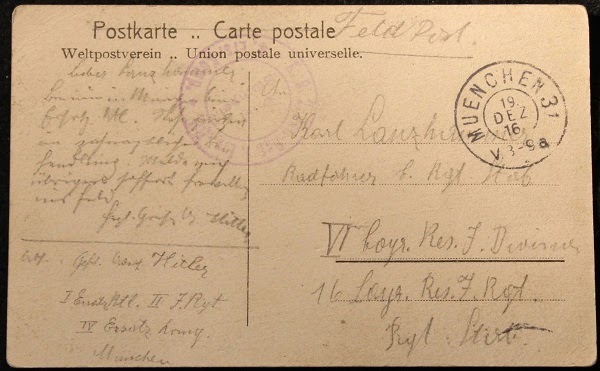 The second postcard surfaced in Bavaria, just like the first one, which was discovered in 2012 during Europeana’s Family History Roadshow in Munich. Dated 21 December 1916, the recently discovered correspondence was again addressed to Lanzhammer, who was in the same regiment as Hitler in the war in France. After an evaluation of the dictator’s dental records, it is possible that Hitler may have exaggerated the episode, as only 15 teeth were believed to have been removed, according to German newspaper Münchner Merkur, which broke the news about the postcard. However, the procedure provides an explanation as to why Hitler was not at the front from early October 1916 to early March 1917. A Library for Children — the Stone Avenue Branch. The Stone Avenue Library Branch has stood at 581 Mother Gaston Boulevard for 100 years, and has recently celebrated that fact with a renovation and re-opening party. Of course, the street wasn’t called Mother Gaston when the branch was built — that came later, after local activist Rosetta “Mother” Gaston opened the Heritage House as an education and community center in this very library. Another name change worth noting is that of the branch itself. Now known as the Stone Avenue Library, it first opened its doors in 1914 as the Brownsville Children’s Library — reportedly the first library in the world to cater specifically and exclusively to children. In a striking about-face, the New York Public Library has abandoned a renovation plan that would have turned its research flagship on 42nd Street into a circulating library and instead will rebuild the Mid-Manhattan library on Fifth Avenue, several library trustees said. “When the facts change, the only right thing to do as a public-serving institution is to take a look with fresh eyes and see if there is a way to improve the plans and to stay on budget,” Tony Marx, the library’s president, said Wednesday in an interview.